At the sidelines of the 2017 East Asia Summit (EAS) in Manila, senior officials from Australia, India, Japan and the United States’ respective foreign ministries met under the aegis of the ‘Australia-India-Japan- United States consultations on the Indo-Pacific’. This was followed by a stage-managed meeting of the four countries’ naval chiefs at the Raisina Dialogue, a Track 1.5 process in India. The 2007 still-born Quadrilateral Security Initiative was back. ‘The Quad’ was revived because of the growing assertiveness of the People’s Republic of China (PRC). The four powers perceive that organised coordination of security policy is needed to corral a rising power that is disrupting the prevailing order. The PRC’s expansive reclamation activities in the South China Sea, the militarisation of these new features, as well as its efforts to exert influence both directly and covertly across the region are the most concrete factors that brought the four-power initiative back from its decade-long hiatus. Even though Canberra does need to signal its displeasure at the PRC’s intimidating actions, the Quad is not the best way to advance Australia’s interests. If the Quad focuses solely on military-security issues, it is likely to further escalate rather than manage geopolitical tensions. The members’ diverging interests mean the Quad will not have the heft that is needed to change PRC behaviour while at the same time the Quad risks further damaging Australia’s already parlous relationship with Beijing. But Australia cannot walk away from the group because of the reputational damage that it would cause. Instead it must persuade the other Quad members to reimagine the initiative in a manner that has better prospects to advance Australia’s long-term interests. Presently, the precise purpose of the Quad is unclear. For some it is the basis of a 21st century containment in which maritime democracies hold the line against expansion until the many shortcomings of the PRC’s system eventually weaken it and limit its international influence. Others see it as a means to manage great power rivalry. All the while at the official level it is presented in bromide-like terms as a means of developing a shared vision for regional security and prosperity. While the November meeting was foreign ministry- led, the prominence of the naval chiefs in the subsequent gathering, as well as commentary from governments and supporters, make clear that many hope that the Quad becomes an initative for military action to defend the strategic status quo, particularly in the maritime domain. For its supporters, the Quad’s most immediate purpose is to signal the collective displeasure of four maritime powers and their common resolve in the face of growing PRC assertiveness. In all likelihood any coordination among the four powers will be ineffective in limiting the PRC’s influence. Not only is corralling the PRC a fraught business due to the country’s power and economic leverage; more importantly, each of the four parties has somewhat different security interests at stake in the region. While they all have a general interest in curbing PRC assertiveness, there is not a single vital national interest that all four share. Their geographical distance and, with the exception of the US, their limited security resources mean that their top priorities will remain disparate. India is the most obvious. It not only has a set of acute security challenges close to home and prizes its autonomy, but more importantly India does not value the geopolitical status quo ante to anywhere near the level of Japan, the US and Australia. To move beyond blandishments and adopt policy that changes the PRC’s behaviour the group needs more in common than it currently has. If the PRC were simply a security or ideological challenge, as the USSR was, then a geopolitical focus for four-power cooperation might make sense. But as a country that is the most important trade partner of all four Quad members, old-fashioned geopolitics does not generate sound China policy. Any attempt to push back on Beijing’s security policy must recognise the reality of the PRC’s deep economic integration in the region and not operate as if security and economic priorities exist in parallel universes. The Quad reflects the belief that the economic and security aspects of Australia’s national interests can be compartmentalised. The reality is far more complex. Efforts to prioritise the security dimension distorts Australia’s China policy, narrows the capacity to find common ground with the PRC, and risks economic damage to Australia. Finally, government officials claim that the Quad does not target a single state. This is not plausible. The Quad is officially intended to buttress the current ‘rules-based’ regional order in the face of ‘shared challenges’. This is a carefully calibrated diplomatic code to identify the PRC as the problem without saying so explicitly. The Quad is presented as solving this ‘shared challenge’. The risk is that the initiative will create a self-fulfilling prophecy in which the PRC responds by taking military steps to pre-empt efforts to constrain its growing maritime capacity. This perception will encourage an even more assertive PRC approach to the region; at worst it could fuel the paranoid impulses in the PRC’s military that could badly destabilise the region. Rather than managing geopolitical tension, the Quad risks escalating it further. East Asia is in transition and the Quad, as an exercise in putting the security ahead of the economic, is helping to build the foundations for an order in which contestation is a key feature. Arguments in support of the Quad have to recognise that they are contributing to this contested dynamic. Also the experiment with the Quad is one of the reasons the Australia-China relationship is more fraught than at any time since the 1996 Taiwan Strait crisis. The Quad is not the only reason – the Australian government’s poor public diplomacy and the PRC’s overt and covert attempts to interefere in Australian society are also to blame. Nonetheless, the tension between Canberra and Beijing is a reminder of the risk that this policy can further undermine a relationship of vital importance to national well-being. As an attempt at military containment or even as an effort to sustain a regional strategic balance that is favourable to the four countries, the Quad presents significant risks and does not promise a sufficiently compelling strategic payoff to justify those risks. But Australia is diplomatically tied to the grouping. To walk away is not possible – it would signal that Canberra can be swayed by PRC pressure – and the four countries have every right to work collaboratively in response to tectonic change in the region’s strategic order. The challenge, then, is how to make the Quad advance broader goals while reducing its risks. Prompted by the new security challenges posed by globalisation as well as rising uncertainty about the durability of the old security order, from the late 1990s East Asian states began to experiment with multilateral security cooperation. 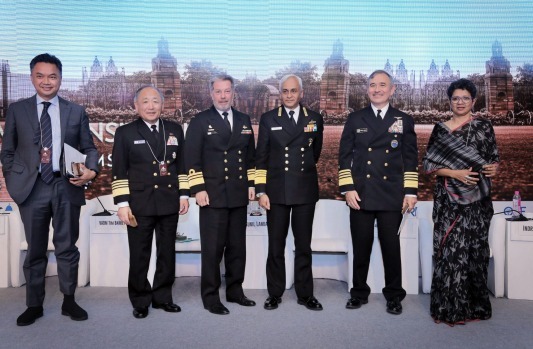 The Association of Southeast Asian Nations (ASEAN) pioneered new initiatives like the ASEAN Regional Forum (ARF), the EAS and the ASEAN Defence Ministers’ Meeting- Plus (ADMM-Plus) process. Similarly, the PRC established the Shanghai Cooperation Organisation and it is attempting to rejuvenate the Conference on Interaction and Confidence Building Measures in Asia. The growth of interest in cooperation spoke to the underlying demand; that so many forums were being proposed and experimented with reflects a failure of supply. If the Quad is conceived in less explicitly military terms and framed as a new form of security multilateralism then it could potentially make a productive contribution to Asia’s international relations. Rather than driving competition it could foster a less contested regional order. Defenders of the Quad argue that its talking points so far are uncontroversial and largely similar to existing regional groupings. This is a deliberate attempt to dampen the diplomatic effect of the meetings to date. But unless the group can distinguish what it does differently from the ADMM-Plus and EAS – in which all four participate alongside the PRC and Russia – it will add little value. Of course, as an exercise in geopolitical containment the Quad could mark itself out as different, but this comes with the problems noted above. How can the Quad avoid those problems while distinguishing itself from existing bodies? There are at least three specific contributions the Quad could make. First, it could be a forum for the coordination of policies that span domestic and international spheres which have security dimensions, such as infrastructure investment, standard setting and economic regulation. Second, it could advance concrete cooperation on specific security issues such as irregular population movement, anti-piracy, and illegal, unregulated and unreported fishing. The EAS and ARF are long on talk and short on action. A small group with strong maritime capacity could make a real difference in these fields. Third, it could be a mechanism in which advancing common security interests de-escalates tension, and builds trust and confidence. It would have the advantage of not being ASEAN-centred thus providing a more promising foundation for genuine cooperative activity. There are a number of steps that the four countries need to take to shift the grouping from its current trajectory. First, the Quad needs to quietly move away from references to the defence of the ‘rules- based order’. A reconfiguring of East Asia’s security order is needed. The dramatic changes in power and the PRC’s growing influence in the region have to be reflected in an emerging security order. Moreover, because the term ‘rules-based order’ is used as a code to criticise the PRC, an alternate formulation is required to describe the order-building function the Quad might serve. The group should focus much more directly on concrete common interests. This would increase the range of countries who could participate and sharpen the focus of the group’s activities. The foundation of shared activity should be the very significant mutual economic interests across the region. Second, the group needs to signal that it is open to any country in the region that wants to join provided the country upholds agreed-to rules and principles that advance shared interests. By being an open, interest-led and principle-driven grouping it could even help forge a shared consensus about a new regional order. Third, it should increase its membership to a Quad-plus. Serious consideration should be given to moving away from the current nomenclature to signal a broader organisational remit and break from the exclusionary nature of the group’s current incarnation. And on that basis the group should welcome the PRC’s engagement. Beijing says that it adheres to international rules and it shares considerable interests with the four powers. By setting standards that reflect a shared sense of the region, a reimagined Quad-plus could provide the means to nudge Beijing into matching its foreign and security policy rhetoric with its deeds. Australia should not abandon the Quad. Instead Australia should advocate a reimagining of the group as a functional multilateral mechanism that is organised around shared interests; these include a stable security order and economic prosperity as well as the management of common security challenges such as terrorism, piracy and Humanitarian Aid and Disaster Relief (HADR). The group should adopt a set of operating norms that are inclusive and collaborative. Membership should be open to all who share agreed-upon principles and interests. It should expand its membership on this basis and move beyond its current label which will remain a problem in public and private diplomacy. Australia should welcome constructive and genuine engagement of the PRC in the group’s activities. Nick Bisley is Head of Humanities and Social Sciences and Professor of International Relations at La Trobe University and a member of the China Matters Advisory Council. He was previously Executive Director at La Trobe Asia, a Senior Research Associate of the International Institute of Strategic Studies and a Visiting Fellow at the East-West Center in Washington DC. China Matters welcomes your ideas and involvement. Read Dr Geoff Raby’s response here. In this policy brief, Professor Nick Bisley addresses the question, ‘Is there a problem with the Quad?’, and argues that in its current form the Quad is likely to be ineffective. The policy brief culminates in several recommendations, including constructive engagement between the Quad and the PRC. The recommendations in this issue evoked considerable contention among the six reviewers. China Matters does not have an institutional view; the views expressed here are the author’s.